VANCOUVER, British Columbia, Sept. 04, 2018 (GLOBE NEWSWIRE) -- Golden Arrow Resources Corporation (TSX-V: GRG, FSE: GAC, OTCQB: GARWF), (“Golden Arrow” or the “Company”) is pleased to announce the results from the Company’s first diamond drill program at the Antofalla silver-gold-base metal project in Catamarca Province, Argentina. The program included over 3,000 metres of drilling in 11 holes testing the "Dome Zone," an area of approximately 4 by 4 kilometres. The program identified a new geologic target at the Cizalla Norte zone, consisting of silver and base metal mineralization in a shear belt, comprised of two parallel composite shear zones, and underlying sandstones. The shear belt incorporates silicified breccias, as intercepted in hole DDA-07 which returned up to 3 metres averaging 191 g/t silver. In the same drill hole, multiple intersections over a 70 metre interval in the adjacent sandstone were well mineralized, including 1 metre averaging 283 g/t silver and 2.1% zinc, 3 metres averaging 131 g/t silver, and 1 metre averaging 110 g/t silver, 1.7% lead and 4.1% zinc. The hole ended in mineralization at 275 m depth. “We are encouraged by the program results, particularly from this new shear zone which appears to have some similarities to mineralization at Chinchillas. With just two drill holes into this 650-metre-long shear belt the target remains open for expansion in both directions and to depth. In addition, the array of current targets in the Dome Zone covers an area of over 1600 hectares, so further geophysics and follow-up drilling is required to properly determine the full potential of the project. We have made the second option payment to the vendor so that we are able to proceed.” commented Brian McEwen, Golden Arrow’s Vice President of Exploration and Development. The Antofalla Project includes a Miocene Dome complex hosted in Permian conglomerates and sandstones, with signatures of both high and low sulphidation epithermal mineralization. 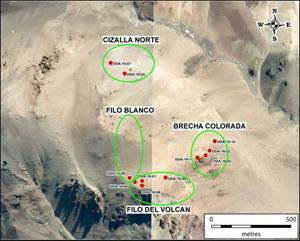 Mineralization has been identified in several areas of the Dome Zone. A review of the initial data indicated similarities to the geologic model for Golden Arrow’s Chinchillas silver project in Jujuy province which is currently being developed through a joint venture between Golden Arrow and SSR Mining Inc. (https://goldenarrowresources.com/projects/jujuy-province/chinchillas). A preliminary geological model for Antofalla is shown in Figure 1. 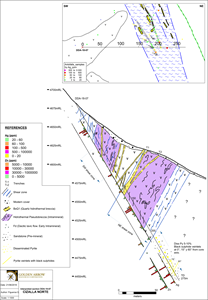 Golden Arrow completed 11 diamond drill holes on 4 main target areas within the Dome Zone (see Figure 2). Intervals with >20g/t silver or >0.1 g/t gold are summarized in Table 1, with hole location information in Table 2. The Cizalla Norte target has emerged as a new focus of exploration potential at the project, as drilling confirmed the discovery of significant silver-zinc mineralization in a shear belt/zone as well as along the contact with, and in, the underlying Permian sandstones. The mineralized contact between the flow dome and the sandstone basement is a similar environment for mineralization as is seen at the Chinchillas silver-lead-zinc deposit. Cizalla Norte (previously Domos Norte). This target is in the north part of the Dome Zone. It includes a composite shear belt of approximately 650 m long with an azimuth of 110° and dipping 50-60° to the SW in dacitic lava flows. This belt consists of two parallel shear zones, each of 35 to 40 metres width, situated 30 metres apart. Silver mineralization appears to be related to hydrothermal breccias and quartz veinlets within the shear zones. Channel sampling of surface trenches cut the Northeast shear zone obliquely, and returned an average of 61.8 m @ 62 g/t Ag (41 samples averaging 1.5 m wide; 6 samples returned > 100 g/t Ag). Holes DDA-05 and DDA-07 are parallel holes drilled into this target, 110 m apart. Both holes intercepted both shear zones. The Southwest shear zone was first detected by these holes because at surface it is covered by alluvium material. Hole DDA-05 encountered isolated intervals of mineralization with up to 2 m @ 116 g/t Ag. Hole DDA-07, 110 m northwest of hole DDA-05, was drilled across the contact through the underlying Permian sandstones. In the shear zone cut by hole DDA-07 there are silicified breccias with up to 3 m @ 191 g/t Ag. At the contact with, and for 70 metres into, the Permian sandstones, from 205 to 275 metres deep, drilling intercepted a sphalerite/galena stockwork zone containing higher silver-zinc values, including 1m @ 283 g/t Ag and 2.1% Zn, 3 m @ 131 g/t Ag and 1 m @ 110 g/t Ag, 1.7% Pb and 4.1% Zn. A cross-section including hole DDA-07 is shown in Figure 3. The presence of the shear belt close to the contact of the underlying Permian sandstones is a new target just partially tested with these holes. Of particular note is that hole DDA-07 ended in mineralization at 275 m depth. Both ends of the shear belt and to depth are open and require testing with additional drill holes. Colorada Breccia. This is a breccia vent target approximately 200 m in diameter characterized by sulphide-mineralized lenticular to irregular shaped hydrothermal breccias. Of the four holes drilled at this target (DDA-02, DDA-03, DDA-10 and DDA-11), only DDA-11 intercepted anomalous values, including 12 m @ 0.31 g/t Au g/t, 109 g/t Ag, 0.4 % Pb and 2 m @ 0.54 g/t Au, 355 g/t Ag and 2.1% Pb. Filo del Volcan. This target includes diatreme breccias intruding dacitic pyroclastic flows. The three drill holes completed on this target (DDA-01, DDA-04 and DDA-08) encountered several high-grade intervals including 2 m @ 145 g/t Ag. This target is linked with the Colorada Breccia by the ENE-WSW fractures which may have controlled the emplacement of these bodies. Hole DDA-09 was drilled in-between the targets and intercepted several hydrothermal breccias with grey silica and pyrite. Silver values were generally low in this hole but anomalous gold intervals (i.e. 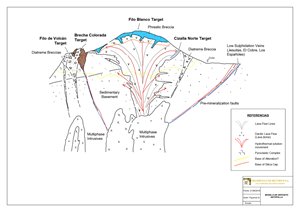 14 m@ 0.16 g/t Au), similar to the Colorada Breccia target, were encountered. Filo Blanco This target is a silica cap. The IP/Resistivity survey indicated a chargeability anomaly situated just below the highest point of the system, coincident with a high resistivity anomaly, at 600 metres below surface. The chargeability anomaly was postulated to represent the feeder of the epithermal system or a porphyry body. Drill hole DDA-06 was drilled to 627 metres to test this target. In the first 250 metres a pervasively silicified dacitic flow was encountered, underlain by dacitic lava flows and pyritic sandstones down to 450 metres. Below 450 metres, and until the end of the hole, lava flows with disseminated pyrite were encountered, but with no significant mineralization. Table 1. Drill Intercepts >20g/t for Ag, or >0.1 g/t Au. Note: The reported intervals are downhole lengths and are believed to approximate true width; this will be confirmed with geologic modeling and further drilling. Drill core was split and half core samples were shipped for preparation and analysis at Alex Stewart-Mendoza, an internationally recognized assay service provider. Samples were assayed for gold by Fire Assay/Atomic Absorption finish and analyzed for a multi-element package by ICP-OES following a four acid digestion. Silver results >100 g/t Ag were re-analyzed by fire assay with a gravimetric finish on 50-gram samples. Lead and zinc results >10,000 ppm were re-analyzed by a three acid digestion and ICP-OES detection. The Company follows industry standard procedures for the work carried out on the Antofalla Project, with a quality assurance/quality control (QA/QC) program. Blank, duplicate and standard samples were inserted in each batch of samples sent to the laboratory for analysis. Golden Arrow detected no significant QA/QC issues during review of the data. The results of the Company's exploration program have been reviewed, verified (including sampling, analytical and test data) and compiled by the Company's geological staff under the supervision of Brian McEwen, P.Geol., VP Exploration and Development to the Company. Mr. McEwen is a Qualified Person as defined in National Instrument 43-101, and has reviewed and approved the contents of the news release. Golden Arrow is an exploration company earning production income. The Company has a successful track record of creating value by making precious and base metal discoveries and advancing them into exceptional deposits. Golden Arrow owns a 25% share of Puna Operations, a joint venture operated by SSR Mining, with more than 8 years of forecast production and upside potential at the Pirquitas-Chinchillas silver mining project. Golden Arrow is actively exploring on its more than 200,000 hectares of properties in Argentina. The Company is a member of the Grosso Group, a resource management group that has pioneered exploration in Argentina since 1993.